Paola at "Antarctica for the Brave" workshop in Antioquia, Colombia. Homeward Bound is an Australian initiative with the goal of upskilling 1,000 female scientists over a period of 10 years, allowing women to have a greater influence on policy and decision-making as we collectively shape our planets’ future. The brainchild of Fabian Dattner (leadership activist and partner at Dattner Grant) and Jess Melbourne Thomas (Antarctic Marine Ecological Modeler), Homeward Bound launched in 2016 with the first 76 of a planned 1,000 women from around the world, all with critical science backgrounds, including astronomers, engineers, physicists, science communicators, Antarctic and Arctic specialists, doctors and social scientists. The women undertook a year-long state-of-the-art programme to develop their leadership and strategic capabilities, using science to build conviction around the importance of their voices. The inaugural programme culminated in the (at the time) largest-ever female expedition to Antarctica, in December 2016, with a focus on the leadership of women and the state of the world. The 2017 cohort is made up of 80 women from more than 20 countries and 128 institutions, of all ages and levels of expertise, who have participated in a year-long programme of climate change, project management and science communication, as well as practical research. The final element of the programme will culminate in the largest-ever female expedition to Antarctica, in February 2018. - and boundless energy and a desire to shake the world. GEO ExPro reader Paola Tello Guerrero, a physicist with seven years experience in the oil and gas industry in Colombia and the UK, was selected to participate in the 2017-18 programme. Paola is the first Colombian to represent the women of her country in Homeward Bound and here she tells us about her experience so far. As part of the oil and gas industry my research is focused on energy transition initiatives. I have always been very proud of belonging to one of the world’s most powerful industries which has in its hands the power to make a difference, both for our wellbeing and for the benefit of future generations. Paola Tello Guerrero - Colombian Pioneer! Paola pictured middle. Paola was born and raised in Colombia (Latin America) and holds a BSc in Physics from the Industrial University of Santander. 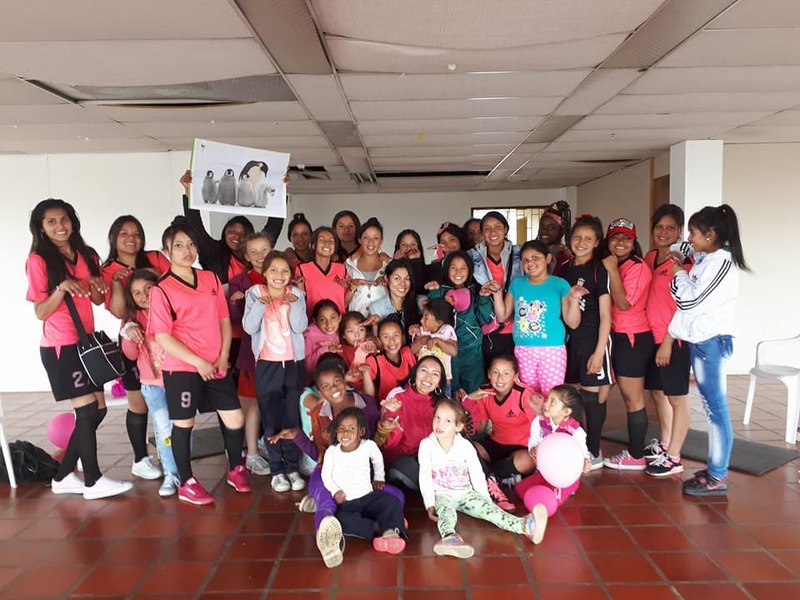 She founded the Colombian Women Geo-Networking, an initiative to motivate women’s participation in geoscience and to promote the exchange of geoscientific information. She is a petrophysicist with ALS Petrophysics, based in Guildford, UK, who have been very supportive of her involvement in the Homeward Bound project. Antarctica for the Brave is Born! 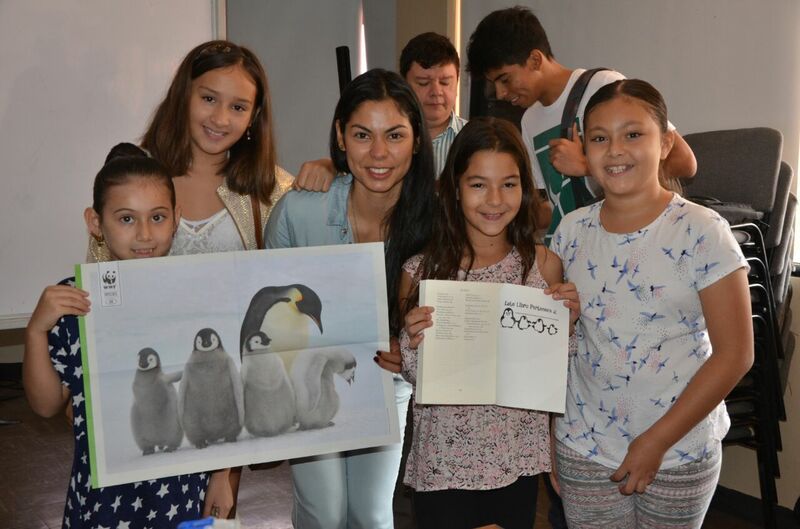 Paola in Colombia at one of her "Antarctica for the Brave" workshops. Pre-expedition, I decided to make the most of this opportunity and integrate it with my passion for children and education. I developed a workshop called ‘Antarctica for the Brave’ about the role of women in science, the application of geoscience and the importance of protecting one of the most fascinating places on earth: Antarctica. - to highlight the application of geoscience in understanding large-scale climate issues. The people of Colombia and the media engaged with my project immediately and I ended up giving 17 workshops in just one month, in locations all over my native country. Visiting remote and poor areas, I had the pleasure of interacting with more than 3,000 people, mostly children, many of whom wrote letters - dedicated to penguins - on how they will take care to protect the planet. Some also wrote to me, telling me how much they want to become scientists. To cover my travel expenses for these workshops I developed a marketing strategy which encouraged six of the most important companies in Colombia to support this initiative. In addition, more than 12 companies are donating their services to help me and the children I am visiting. With the help of a group of 10 volunteers and the donation of a webpage, we distributed 600 books for children and have received more than 500 letters and emails from people who have become totally involved and captivated by this small but growing initiative. The Next Challenge – Antarctica! The next challenge will be the three weeks in February 2018 on the expedition. I anticipate a tough but fascinating adventure: performing research, coaching and making presentations on the different global issues in our area of work. The ultimate purpose is to propose plans and solutions using a multicultural and multidisciplinary approach. 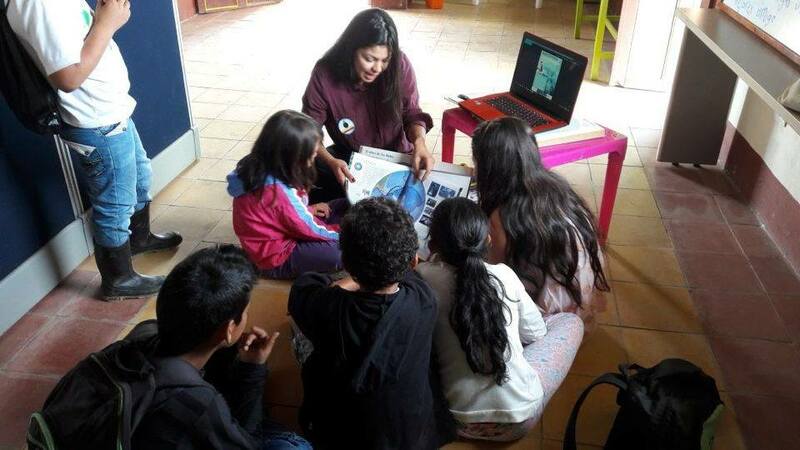 Paola pictured with the children at the "Antarctica for the Brave" workshop in Bogota. Studying in the field of physics, I have always been curious to know more about a phenomenon, and working in the geosciences has increased my awareness and passion for nature. If I can share this passion and knowledge with younger generations, we will have a greater chance of shaping the future scientists who will take care of and improve the well-being of our planet. As scientists of the earth, I feel it is our responsibility to raise our voices within the oil and gas industry and focus on the good initiatives that are in place for energy transition. Setting this example will pave the way for other companies to step forward and act on their initiatives to improve the well-being and future of our planet. Now that people and clients are more aware of the social and environmental responsibility of our industry, more scientists in training want to work for companies that care for future sustainability. 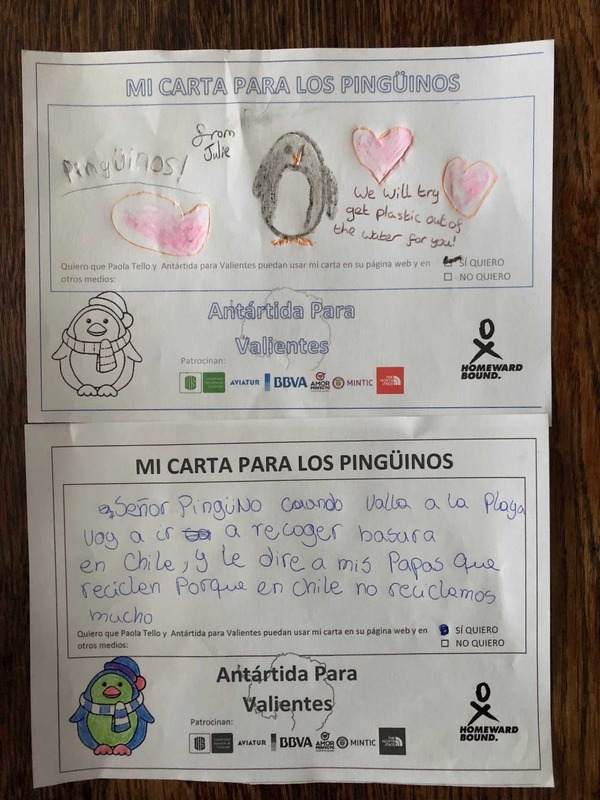 "Mi Carta Para Los Pingüinos" - "My Letter to the Penguins"; letters written by the children of the 'Antarctica for the Brave' workshops across Colombia. These letters will be delivered to the penguins by the Homeward Bound, all female expedition in February 2018. For many years it has been my ambition to work with children, as well as to very proudly promote Colombia as a nation, with her varied microclimates and diverse landscapes. Now this dream is slowly being realised! I am a Colombian ambassador working for education and equality, and affecting real lives – knowing that all of these children will have a much better chance of growing up in a society where women and the planet are treated with maximum respect. I encourage you all to get involved through small actions and make mindful personal decisions, as well as embrace the big ideas and ambitious plans that enable us to enjoy our time living fully, and more importantly, improving the lives of others. If you would like to follow this adventure, please add me on Facebook, Instagram and Twitter (@pateguerrero), or if you have questions, ideas, actions, words of encouragement, or would like to get involved – please let me know: [email protected]. You can find more information on the 'Antarctica for the Brave' workshops here: http://www.antartidaparavalientes.com. To all those participating in the Homeward Bound expedition to the Antarctica in February, we wish you all the best of luck and although a challenge is ahead of you, we believe you will have a fantastic time. Stay safe! Dr. David A.T. Donohue, PhD, JD.